With a societal shift towards storing data and information digitally, cyber-attacks are on the rise, so a robust and secure cyber platform is critical for the United States. Both the current and previous administrations have taken steps to modernize and consolidate the nation’s cyberinfrastructure. Most recently, President Trump underscored the need for cyber-development by signing the “Strengthening US Cyber Security and Critical Infrastructure” Executive Order in May 2017. It calls for an immediate review of federal agencies’ security framework, an increase in skilled cybersecurity talent, and an adoption of the NIST cybersecurity risk framework by all federal agencies. The Trump administration’s cybersecurity policy builds upon initiatives from the Obama administration. The “Federal Cybersecurity Research and Development Strategic Plan,” published in February 2016, outlines how the U.S. government can spur cyber development on a national scale through federal funding. The plan suggests that cyber-related research should be executed “in-house, at national laboratories, or in academia via grants, other transactions, cooperative agreements, or contracts.” Such bipartisan support for cybersecurity initiatives highlights the importance of cyber research and development to the nation’s security. 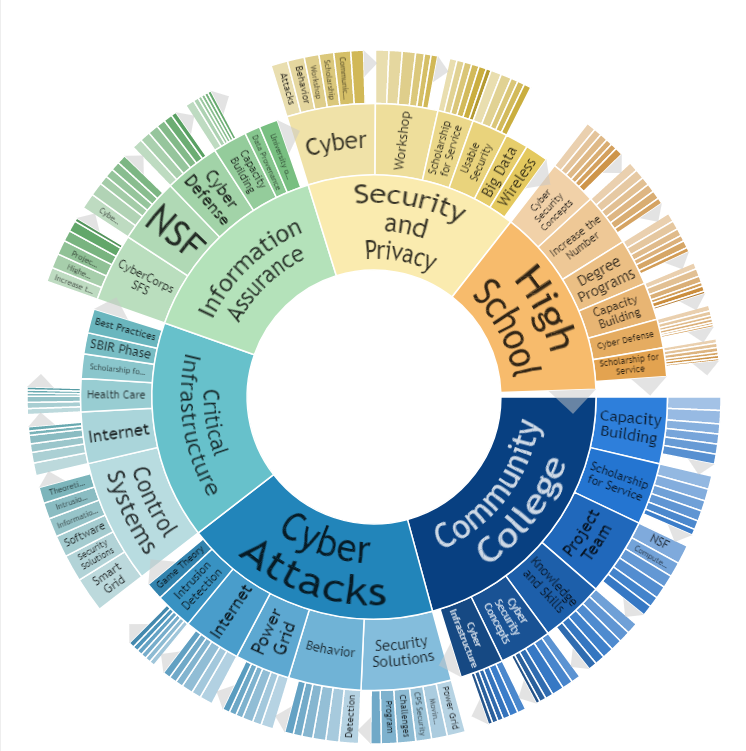 Topic Visualization of FY 2012-FY 2016 Awards for “Cybersecurity.” Source: Federal Reporter. Several federal agencies currently provide funding for academic institutions to support the federal government’s cybersecurity goals. Science agencies like the National Science Foundation (NSF) and the Department of Defense (DoD) make the majority of grant awards in this space. For example, in November 2016, NSF announced $76 million in research funding through its Secure and Trustworthy Cyberspace (SaTC) program to study the scientific, engineering, and socio-technical aspects of cybersecurity. These awards support 241 projects across 36 states and 129 institutions, and touch on all aspects of the field: hardware, software, network security, human incentives and behaviors, and the integration of computation with the physical world. The SaTC program is inspired by, and aligned with, two new strategic plans that the Obama administration released in 2016: the Federal Cybersecurity Research and Development Strategic Plan and the National Privacy Research Strategy. Both initiatives are dedicated to protecting and preserving the growing social and economic benefits of cyber systems, while ensuring security and privacy. Other governmental agencies such as the Department of Homeland Security (DHS), the Department of Energy (DOE), and the Department of Justice (DOJ), are playing a larger role in supporting research, technology development, and education aimed at securing the nation’s cybernetworks. According to Federal Reporter, more than 600 standalone awards were made for “cybersecurity” initiatives in FY 2012 – FY 2016 across a number of topics and domains, totaling over $283M. In addition to grant funding, Federal Advisory Committees play a significant role in shaping federal cyber research priorities. McAllister & Quinn therefore provides prospecting and proposal development services to clients that have an interest in cybersecurity. Our service offerings, include; limited submission review and down selection; literature review and competitive analysis; team coaching and facilitated brainstorming; project management and grant writing; color team review; and also, copy editing and graphics development. Contact McAllister & Quinn if you or your institution has an interest in cyber research.